Northern leopard frog (Rana pipiens), Pyramid Lake Paiute Reservation, lower Truckee River. Photo: K. McCutcheon. Dark, rounded spots with pale borders. Olive green or brownish base color. Body less than 5 inches long. Northern leopard frogs are native to much of North America, and found near springs, creeks, rivers, ponds and reservoirs with permanent water and aquatic vegetation. They sometimes travel into meadows to feed (Stebbins 1966). Leopard frogs feed on insects, leeches, spiders, fish, other frogs, snakes and even birds. For more information, check out AmphibiaWeb’s page on leopard frogs. In Nevada, Northern leopard frogs were once “the commonest and most widespread kind of frog in the state” (Linsdale 1940), but today populations are in decline, especially along the Truckee, Carson and Walker Rivers (Rogers & Peacock 2012). In 1940, a study recorded leopard frog presence on the Truckee River as far upstream as Verdi and as far downstream as The Willows near Pyramid Lake (Linsdale 1940). 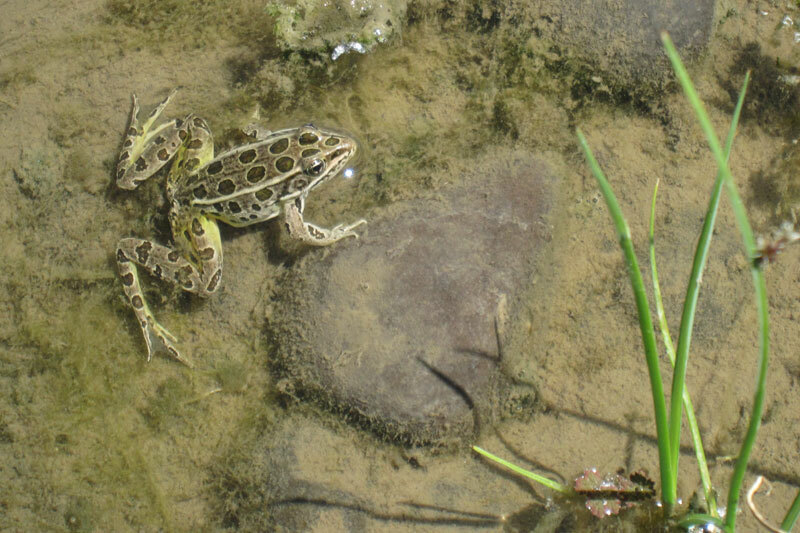 In 1994, a survey of Truckee River amphibians and reptiles found only one remaining population of Northern leopard frogs, located at a site on the Pyramid Lake Tribe Reservation between Wadsworth and Nixon (Panik & Barrett 1994). Here, the researchers counted 31 frogs near the river, and two in a nearby spring-fed pond surrounded by bulrush (Scirpus acutus), saltgrass and sedges. Between 2006 and 2009, egg masses from the Paiute Reservation’s population of leopard frogs were collected and raised in captivity by Otis Bay Ecological Consultants. These frogs were released into restored ponds at McCarran Ranch, a Nature Conservancy site on the lower Truckee River. More recently, however, researchers from University of Nevada, Reno completed a genetic analysis of the northern leopard frogs of Northern Nevada and were able to locate only four surviving leopard frogs at McCarran Ranch. A high density of bullfrogs, predators of the leopard frog, were present at the site (Rogers & Peacock 2012). If you see a leopard frog on the Truckee River, be sure to take a photo and submit an observation! Northern leopard frog (Rana pipiens) on lower Truckee River. Photo: K.McCutcheon. Linsdale, J. M. 1940. Amphibians and Reptiles in Nevada. Proceedings of American Academy of Arts and Sciences, 73 (8), 197-257. Panik, H. R., & Barrett, S. 1994. Distribution of Amphibians and Reptiles Along the Truckee River System. Northwest Science, 68 (3), 197-204. Rogers, S. D., & Peacock, M. M. 2012. The disappearing northern leopard frog (Lithobates pipiens): conservation genetics and implications for remnant populations in western Nevada. Ecology and Evolution, 2 (8), 2040-2056. Stebbins, R. 1966. A Field Guide to Western Reptiles and Amphibians. Boston: Houghton Mifflin Company. Very cool observation! I’d love an opportunity to photo the a leopard frog from our local population.